Want to add the weather for the latest weather information to your blocs site? Then this is the extension that your need. 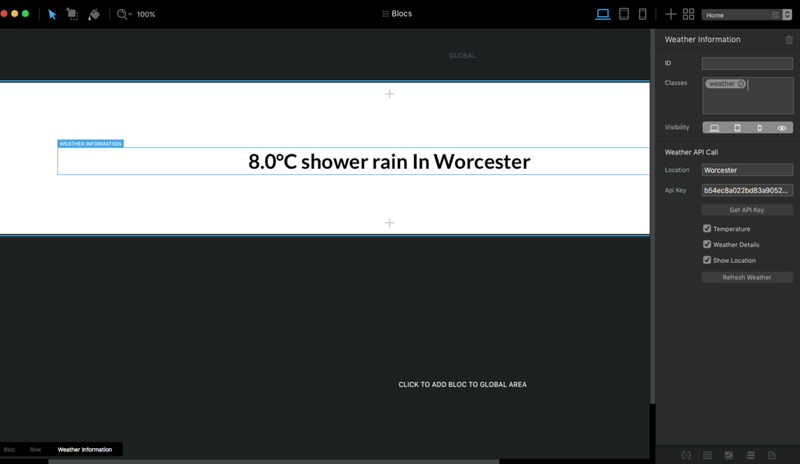 With this extension you can add weather from any location around the world onto your blocs site and edit it however you like to fit the style of your site. To use it just add in the location you want the weather for and most locations around the world are supported. Grab an api key from the link provided and then click refresh weather to get the latest forecast. Style the text output by adding a class of weather to the element then edit away. It would be good to see this running in a live demo. It’s only £2.50 just to cover the few hours it took me to build. I hope it works out for you. Stick to your price though - between the original post and that one the price has been reduced 50p. People don’t buy things like this because of a cheap price. Cool idea, looking forward to seeing more. With great respect to the effort. Super easy to customize and even responive. Looks good, with my extension you can style it more as it produces text that can be manipulated by blocs. Would love to see it live - even how it reacts responsive. Till then I am more than happy with my free tool. Anyhow - respect for your efforts. Can this give weather to the viewers specific location? I think that won´t work as you have to set a location of your choice.